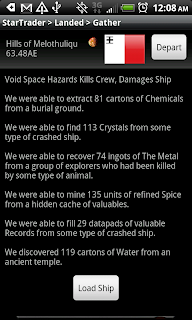 A new version of Star Traders RPG can be found on the Android Market. We also have had some reports from the player's forum (http://startradersrpg.proboards.com/index.cgi?board=rules&action=display&thread=961) about a crash during a Blockade. We believe that this release should both fix that crash and improve the performance of blockade. Several major ship changes were tested leading up to this release, these centered around military ship costs for Fast / Quick ships as well as a re-balancing of some starting ships and Rank / Unlock ships. This thread (http://startradersrpg.proboards.com/index.cgi?board=tips&action=display&thread=907&page=1) from the forum touches on some of those topics as well. In addition to these changes a revision has been made to the core pricing logic for ship trade ins and ship yard pricing calculations. These should result in overall better trade in prices and slightly more expensive ships for higher difficulties.